Dr. Siegel is System Chief, Interventional Radiology Services, North Shore LIJ Health System, and Associate Professor of Radiology, Hofstra North Shore LIJ School of Medicine, New Hyde Park, NY. Interventional radiology has evolved rapidly over the last two to three decades, primarily due to refinements in catheters and catheter-based devices. These technological advances have allowed for the development of new techniques and applications of interventional therapy in territories previously not reachable. While image quality has improved and digital technology has been used to its full advantage over time in the evolution of angiography and interventional radiology suites, until recently little had really changed with respect to the way imaging has been utilized to guide these interventional procedures. Cone-beam computed tomography (CT), developed several years ago, has revolutionized the way we guide procedures by allowing for soft-tissue imaging in the angiography suite that can be used with fluoroscopy. While rotating C-arms and 3-dimensional (3D) acquisition techniques were developed nearly 20 years ago, current technology adds the ability to image soft tissue with CT, along with improvements in fluoroscopic and angiographic imaging of contrast-filled vessels and other structures. Techniques for software reconstruction, manipulation, and analysis continue to be refined, and they now aid the interventional radiologist in guiding both vascular and nonvascular procedures in ways unimaginable as recently as 5 to 7 years ago. At the forefront of the development of this technology is Philips Healthcare, whose flagship interventional suite is the Allura Xper FD 20 system. Besides providing the high-quality fluoroscopy and digital x-ray acquisition systems now customary in modern interventional suites, the ceilingsuspended C-arm of the Allura Xper FD 20 system can perform high-speed rotational scanning with or without simultaneous contrast injection, depending on the situation. This digital image dataset is then processed in seconds; depending on the technique utilized, the dataset provides interventionalists with a 3D vascular or soft-tissue image for diagnosis and 3D road mapping. Using the dedicated XperGuide software, this dataset also can be used to guide percutaneous interventions with the aid of interactive needle-path planning and guidance software. This sophisticated software overlays a preplanned needle path, which the operator designs at an integrated workstation. Previously acquired CT scans and images from other modalities, such as magnetic resonance imaging (MRI) and MR angiography, can also be imported and superimposed on a fluoroscopic image. This article reviews the different abilities of the 3D tools available in newer interventional suites and provides an overview of their various clinical applications. Rotational angiography takes advantage of the C-arm’s ability to rotate rapidly around the patient and acquire angiographic images at numerous oblique projections around its arch. Contrast injection volume and duration must be coordinated with the rotation speed and the desired images. Angiographers understand that the ability to see a vessel’s origination or the exact point and angle of branching is essential to planning procedures that require selective catheterization and precise endovascular therapy. The 3D reconstructed angiogram can also be used for 3D road mapping. The 3D image can be superimposed on the live fluoroscopic image and manipulated together with the live fluoroscopic image. Oblique angles can be obtained, the patient can be moved, and the image can be magnified during endovascular manipulations and interventions. Previously, numerous stationary oblique “runs” were required, using trial and error; once the appropriate projection was determined, it was then employed for treatment planning and guidance. With practice, interventionalists gain an understanding of when the added time, contrast, and radiation of these rotational acquisitions will ultimately lead to lower cumulative procedural time, contrast use, and exposure. 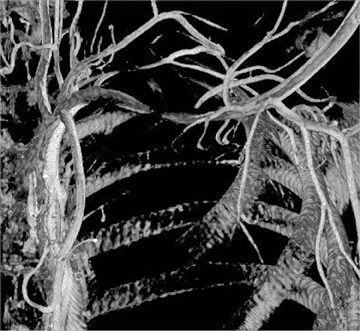 Understanding the relationship of vessels to surrounding structures can be essential to diagnosing different vascular conditions. Paget-Schroetter syndrome, or thoracic outlet syndrome, is a condition where the subclavian vessels are crushed between the first rib and the clavicle and confined by the scalene muscles between those bony structures. This generally occurs when the affected arm is abducted and extended. 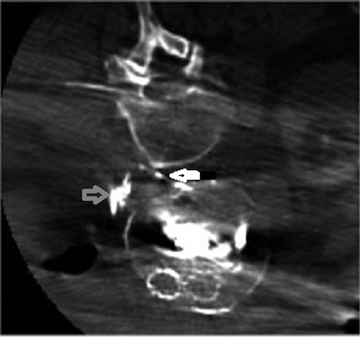 Figure 1 is a cone-beam CT image that demonstrates Paget-Schroetter syndrome. On this image, compression of the subclavian artery by the surrounding structures is beautifully depicted. XperCT can also be employed during interventional procedures to locate and evaluate devices. We have used cone-beam CT imaging to guide filter placement in patients with severe contrast allergies or renal failure, to guide fenestration of aortic dissections by locating the appropriate point for flap puncture, and to evaluate the course of catheters or guide wires when it is unclear if the true lumen of an occluded vessel was traversed or if a collateral vessel that would be dangerous to dilate was catheterized. The applications for this technology continue to expand. Radiation exposure to the patient is certainly a factor in deciding how and when cone-beam CT and/or 3D angiography should be utilized in interventional practice. 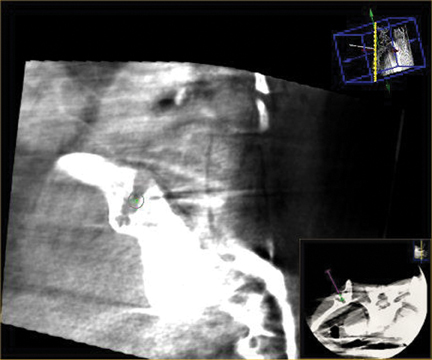 While rotational C-arm imaging techniques certainly deliver a greater radiation dose to the patient than does conventional fluoroscopy, in many situations, this technology can actually dramatically decrease the total fluoroscopy time and number of individual digital acquisitions—therefore decreasing overall radiation exposure. We now use XperGuide in many clinical situations where accurate CT-needle guidance placement is needed in conjunction with additional vascular or nonvascular catheter and guide wire-based procedures. 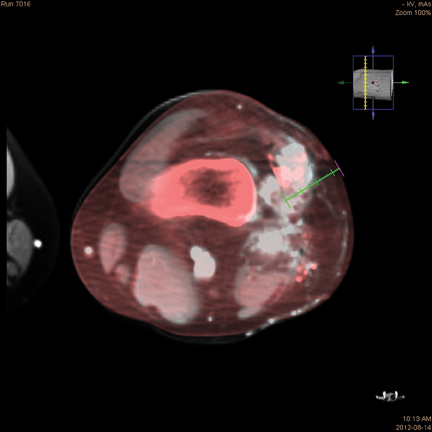 The combination of soft-tissue CT imaging, needle-guidance software, and 3D angiographic imaging can often simplify what would be relatively complex or cumbersome procedures; at times, it eliminates the need to move a patient from one suite to another where these different modalities are available. There are several reports of translumbar endoleak embolization utilizing cone-beam CT guidance for sac puncture.3 Figure 3 demonstrates an example of XperCT following endoleak embolization using coils, a vascular plug, and tissue acrylic. We regularly perform nephrostomy placement, biliary drainage, and complex fluid collection drainage with Xper guide. Needle placement can be guided with the accuracy of CT imaging in an environment where subsequent catheter manipulations and exchanges can be performed with high-quality fluoroscopic guidance. Needle guidance has significantly expanded our interventional armamentarium. For example, we have performed puncture and intubation of the pancreatic duct for stenting of a persistent leak. Utilizing overlay of an MR image for targeting the cisterna chili, we were able to access the thoracic duct and then embolize a postoperative leak. Figure 4 demonstrates an intraprocedural XperCT with MR overlay, obtained in a patient with a venous malformation where recurrent symptoms were related to a deeper, previously untreated loculation. This deeper portion of the malformation was targeted and successfully treated with sclerotherapy, resulting in complete symptom relief. The availability of 3D angiographic and CT imaging with needle-guidance software in the traditional interventional environment brings us one step closer to the full-service, image-guided procedure suite, where interventional radiologists can perform all procedures with the required technology at their disposal. Future developments in this technology should continue to enhance our precision and expand the role of interventional medicine. Acknowledgement: The author would like to thank his colleague, Igor Lobko, MD, for his collaboration in much of the work discussed in this article. Tognolini Alessia, Louie John D., Hwang Gloria L., et al. Utility of C-arm CT in patients with hepatocellular carcinoma undergoing transhepatic arterial chemoembolization. J Vasc Interv Radiol. 2010;21: 339-347. Braak Sicco J, Strijen van Marco JL, Es van Hendrik W, et al. Effective dose during needle interventions: Cone-beam CT guidance compared with conventional CT guidance. J Vasc Interv Radiol. 2011;22:455-461. Bindsbergen van Lars, Braak Sicco J, Strijen van Marco JL, de Vries Jean-Paul PM. Type II endoleak embolization after endovascular abdominal aortic aneurysm repair with use of real-time three-dimensional fluoroscopic needle guidance. J Vasc Interv Radiol. 2010;21:1443-1447. 3D imaging in the angiography suite advances interventional patient care. Appl Radiol.